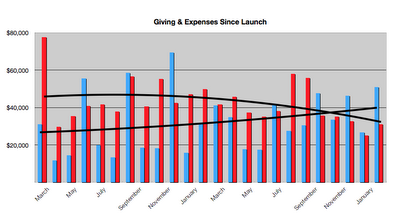 Thanks to your generous giving yesterday, it appears that Access has met our giving budget for the month—again! This is such an encouragement as we move ahead with great hopes for 2009! In addition to our regular offerings, we received a substantial gift from a local foundation that believes in our strategy of creating irresistible environments. This gift will help to restore our cash reserve, depleted last fall. The foundation gift skews the following graph a bit, but nevertheless shows the impact your giving is having on the future of this organization. 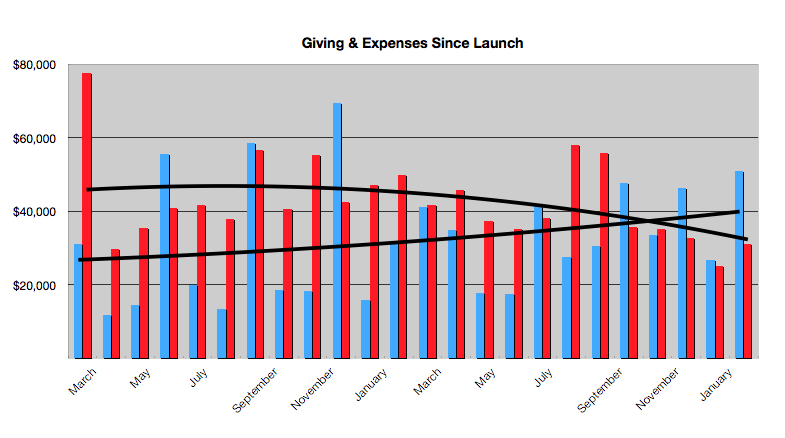 Our goal for March is ambitious—$6,600 more than February. Pray that we'll continue to be a generous church! And, just as I was typing this, a local business offered to donate all the burgers for our two-year-anniversary cookout this Sunday! Amazing! So, come for great music (Tenth Avenue North will start at 10:15am), a great message from Andy Stanley, and great food. See you Sunday! People in this city will spend eternity with their heavenly father because of how you are investing His resources!